Earn a living and a degree on the N.O.W. Plus Pathway. Options are available to complete your degree 100% online – contact us today! N.O.W. Plus stands for Nights, Online and Weekends, plus specialized supports to help working professionals be successful in earning a degree. The N.O.W. Plus pathway supports working people with the flexibility to learn part-time while they earn. N.O.W. Plus helps working professionals earn degrees even faster with personalized admissions guidance and advising throughout your program. Whether you choose the 90-credit Bachelor of Commerce (BCom), the 90-credit Bachelor of Human Resources Management (BHRM) degree or the 90-credit Bachelor of Arts in English offered by the Faculty of Liberal Arts & Professional Studies, you’ll learn the same material from the same instructors and professors as other students — but on a schedule that fits your life. Go N.O.W. – Apply by April 1, 2019 for Summer 2019! Need advice or help with your application? Call 416-736-5616 or drop in during office hours. After-hours inquirers will be contacted the next business day. A N.O.W. Plus Bachelor of Commerce (BCom), Bachelor of Human Resources Management (BHRM), or Bachelor of Arts in English degree is the same Liberal Arts & Professional Studies degree as other students take. It’s just more convenient. You can enrol in as many or as few courses as you like, but we recommend starting with one course in your first term to help with your transition and no more than two per term after that. If you then plan to take five courses each year after that, you’ll complete your degree in six years. If you’ve already completed some post-secondary courses, you may be eligible for transfer credit that would allow you to finish faster. For example, if you have a three-year advanced diploma from an Ontario college, you could complete your degree in just three and a half years. More than 9,000 mature students study at the Keele Campus or online. Events like the Atkinson Centre for Mature and Part-time Students (ACMAPS) Orientation will help you get to know a few of them and learn about the services available to help you be successful. You can also find networking opportunities through the York University Mature Students Association. You’ll have access to the supports, curriculum, financial aid and student services that other Liberal Arts & Professional Studies students have. You’ll learn from the same instructors. And you’ll graduate with the same degree. Many students prefer studying online for the convenience of learning from home or the office. Others choose to lighten their on-campus schedule by mixing in online courses. Online courses count towards your degree in exactly the same way as in-class courses do. Students enrolled in online courses will be expected to complete assignments by specific due dates, follow a weekly schedule for learning activities, and write supervised formal on-campus examinations in person. Students more than three hours away from the University may arrange to write exams at another approved post-secondary institution or, when possible, write them online. Online courses are convenient but require additional responsibilities. We recommend that you consider the following before choosing to study online. How are your time-management skills? Time-management and study skills are very important in an online course. It’s hard to catch up once you’ve fallen behind. You’ll have group members depending upon your regular participation, and assignment deadlines to keep in mind. But if you follow the instructor’s suggested weekly schedule, you can stay on track. Will you be able to take initiative? In an online course, you’ll need to be comfortable with an instructor in the role of course leader/guide rather than lecturer. You’ll be absorbing information from readings, discussions, and asking questions. You’ll need to be willing to ask for the help you need from your instructor or TA, from classmates, or from the distance education/technical support. Can you devote approximately 6-9 hours of study time per week for each course? While online courses are more convenient, they’re not necessarily easier. They often require more time than a lecture on campus because you are responsible for managing your learning. When you study online it’s easier for other activities to take priority and keep you from getting to your course work. Are you comfortable expressing your thoughts in writing? In an online course, you may be asked to write defensively and argue thoughts and issues as you communicate in the discussion area. You’ll need to be ready to share and post your thoughts and opinions with your fellow students in a respectful manner. The benefit is that you can take the time to think about what you are writing. You will be required to log into the course website on a regular basis. All academic work and communications will be located there so it is important to log in a few times a week. Are you open to learning some new Web-related skills? In order to participate in your online course, you’ll need to feel comfortable navigating the course website by using a browser, email, discussions, chats/wikis, and assessment tools. You’ll have the chance to learn and practise these skills as you participate in your course. Remember, these are guidelines to help you think about the skills you’ll need. They will help you prepare to become a successful online learner. We recommend that you register for the online version of Mature Student First-Year Experience Program with the Atkinson Centre for Mature and Part-time Students (ACMAPS). If you can make the time, the ACMAPS also offers a face-to-face orientation program in September. Please take advantage of the unique services of the ACMAPS to help you get the most out of your degree. As a pioneer in designing university courses for working professionals, York has the expertise to offer more than 9,000 mature students a thought-provoking, meaningful education experience. Our courses are offered at our vibrant Keele campus, conveniently located near several 400-series highways and accessible by the TTC, GO, York Region, Brampton, and Viva transit systems. Please view our interactive map for more information on the campus including parking, directions, and amenities, or download our accessibility, Wi-Fi hot spot, gender-neutral washroom, and other maps. The Keele Campus is a self-contained community located in the centre of the Greater Toronto Area. Five libraries, 92 buildings, athletic facilities, residences, a shopping mall, and green, groomed outdoor common areas make up a buzzing campus primed for your academic success and an active campus life. Although this is one of the largest university campuses in Canada, York has a reputation for being friendly and welcoming. If you need help, just ask. We recommend that you register for an orientation session and the Mature Student First-Year Experience Program with the Atkinson Centre for Mature and Part-time Students (ACMAPS). These programs have been designed to help you get the most out of your degree. To help you earn your university degree part-time while working, we offer N.O.W. Plus students reserved registration: this means that core program Night, Online, and Weekend courses have spaces reserved exclusively for N.O.W. Plus students. These spaces will be held for N.O.W. Plus students up until classes commence at the start of each term. Visit our Transfer Credit page for details on transferring courses you’ve taken at other institutions to York University. Is the N.O.W. Plus degree pathway different from the related undergraduate degree courses at York? No, the N.O.W. Plus degree pathway facilitates degree completion by offering schedules, enrolment processes and student services that meet the unique needs of working students. York University offers additional part-time and online degree options outside of the NOW Plus degree pathway. 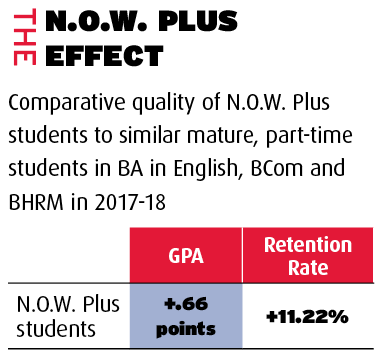 Who is eligible for the NOW Plus degree pathway? is using the N.O.W Plus application form. is using the N.O.W. Plus application form. Applicants who do not fit this criteria are encouraged to apply through futurestudents.yorku.ca. Will I be the only mature student in my course? Your classmates will be a mix of full-time undergraduates and working students. Currently, York has 9,000 mature students, and we expect this number to increase. No, there is no requirement to take a certain number of courses each semester. But to remain actively registered at York University, you must take at least one course within one academic year (during the fall, winter, or summer terms). What do you mean when you say that N.O.W. Plus students get reserved spaces in courses? Spaces will be held specifically for N.O.W. Plus students in BAS, BA in English, and BHRM core courses, up until the day classes start. I don’t have time to meet with an academic advisor. Do I need to set up a meeting? New students with transfer credits will need to meet or speak with an advisor in order to register for their first course. Your advisor will help you pick the courses you need to satisfy your program’s requirements. Advising appointments are available to be booked in person, over the phone, or via email. New students without transfer credits will automatically be invited to participate in the YU Start online enrolment module. This module provides a step-by-step guide on how to enrol in courses. Your Continuing Studies Advisor will be available to provide guidance throughout the process; however, you will still have the opportunity to book a distance or in-person advising appointment if you require further assistance. How much time do I have to spend on campus? For night and weekend courses, you can expect to spend three or four hours per week in class in addition to your scheduled exams. For online courses with a final exam, you should expect to be on campus for three to four hours for the exam, and we strongly encourage you to arrive on campus early. Students taking online courses who live more than three hours away will be able to write their exams at a location closer to their home. The bookstore offers online shopping so you won’t need to come to campus for course materials. What degrees can I take in N.O.W. Plus? The 90-credit Bachelor of Commerce (BCom), the 90-credit Bachelor of Arts in English, and the 90-credit Bachelor of Human Resource Management (BHRM) are currently offered in the N.O.W. Plus degree pathway, with more to come as N.O.W. Plus develops. How many credits do I need to complete my degree, and how quickly can I complete my degree? The N.O.W Plus pathway offers 90-credit degree programs which allows N.O.W. Plus students to graduate at least two years earlier than students in other part-time degrees (which are typically 120-credit programs). If you take the recommended 5 courses per year, you can complete your degree in as little as 6 years with no transfer credit and in as little as 3.5 years with some transfer credit. Does York University offer part-time or online degrees outside of the N.O.W. Plus degree pathway? For information on other York University part-time and online degree options, please visit the the part-time study or distance education pages. Learn to find strong people and build strong teams. Options are available to complete your degree 100% online – contact us today! The Bachelor of Human Resources Management offered by York’s School of Human Resources Management is the largest of its kind in the world, with approximately 1000 students. On a N.O.W. Plus pathway, you can complete the 90-credit program in just six years or less. Be taught by leading experts in the field, many of whom are active in the Canadian business sector. Develop the research, analytical and management skills required to deal effectively with a variety of organizational situations. Draw from a range of areas including business, economics, psychology, and sociology. Hone your ability to make complex decisions quickly and effectively by learning to process, synthesize, and communicate information. Explore extracurricular opportunities at the HR student club, career management workshops, and networking events with senior HR professionals. Graduate with skills employers value. Thrive in roles beyond traditional HR. Graduates regularly go on to successful careers in law, academia, government, labour, policy, and planning and business. Apply by April 1, 2019 for Summer 2019! N.O.W. Plus is designed to help working adults earn a degree without disrupting their careers. You’ll have spots reserved in core Night, Online, and Weekend Human Resources Management courses, and you can take daytime courses if your schedule allows. To earn a Bachelor of Human Resources Management degree you’ll need to earn 90 credits. The specific courses you need to take will depend on which electives and optional courses you choose. Courses are typically worth three credits each. When applying to the Bachelor of Human Resource Management, you’ll want to ensure you have the math prerequisite required for admission to the program. If you do not have the math prerequisite, or, are not sure, contact us for assistance continue@yorku.ca. Once you’ve been accepted into the program, an advisor will be available to help you plan a schedule to complete your degree as efficiently as possible. Meet with our Continuing Studies Advisor to review the applications process and admission requirements. Successful completion of grade 12U high school math course (Calculus and Vectors MCV4U, Advanced Functions MHF4U or Mathematics of Data Management MDM4U) or the Math for Admissions course . If you are unable to come to campus, contact us for other options. Complete the N.O.W. Plus online application form. Approximately one to three days after the receipt of your application, you will be issued a reference number by email. Use that number to log into MyFile to submit your required documentation and pay your application fee. Applications will be considered within ten business days of the admissions office receiving your complete documentation and application fee. You should expect an email from the admissions office within a few days. Schedule an advisory appointment or enrol in YU Start – an online orientation for enrolling in courses. If you have credits from another university to transfer, you’ll want to book your in-person advising appointment as soon as possible. This will trigger a detailed assessment of credits applicable to your program. During your appointment, you’ll learn how to register for courses. If you do not have transfer credit, you’ll receive an email inviting you to join YU Start – York University’s online orientation for enrolling in courses. You’ll need to complete the first module in order to gain access to course registration. If you prefer an advising session (in person, via email, or phone) you can request this through www.yorku.ca/myfile. Sign up for “Passport York” so you can enrol in your courses during your appointment. Confirm your course(s) and pay your registration deposit. Review the information and presentation provided at your appointment, and don’t forget to pay your enrolment deposit by the deadline. This will secure your space in your courses, and make critical tools and services available to you including financial aid, letters confirming registration, parking permits, and university libraries. We also recommend that you register for an orientation session and the Mature Student First-Year Experience Program with the Atkinson Centre for Mature and Part-time Students (ACMAPS). There is a one-time non-refundable application fee of $100, due upon submission of your completed application. Please note that applications will not be reviewed until this fee is paid. Your fees are based on the year you began your studies, the degree you’re pursuing, and the number of credits you take each term. We recommend that N.O.W. Plus students enrol in one three-credit course in their first term and two courses each term after that. The most up-to-date fees can be found on the Faculty of Liberal Arts & Professional Studies fees page. You will be asked to pay a $300 registration deposit once per session to confirm your registration and unlock services (including financial aid). This is not an additional fee over and above course fees. Please visit Student Financial Services for more detailed information on fees including the option of how your employer or other third party can pay your fees directly to York. N.O.W. Plus degrees are eligible for the same financial aid options open to other part-time students enrolled in the Bachelor of Administrative Studies or Bachelor of Human Resources Management. Top employers encourage their people to continue their education through tuition assistance programs. These programs are usually coordinated through the company’s Human Resources office. Not sure if your employer offers this? Ask your supervisor or contact your HR office. Many adults who apply to N.O.W. Plus have taken courses at another Canadian or international university or college. Some of these course credits may transfer to York University, and will help you complete your degree even sooner. You can receive guidance on the Transfer Credit process prior to applying to N.O.W. Plus. Before you meet with your academic advisor to enrol in courses, your transfer credit assessment will be available to help you make informed course choices. We are committed to helping you navigate the transfer credit process, and to ensuring that you receive a fair and timely assessment of your transfer credits. Please check the Transfer Credit website for more information.